That is terrible. I still need to take my lights down too. I hope they are not like that. I really do not know how you could get that off of them without doing them one by one. You may ruin them if you try something else. Gee, I have no idea. Can you use a spray bottle with vinegar and water in it and let them dry over the next year? That's weird, I've never seen that before! 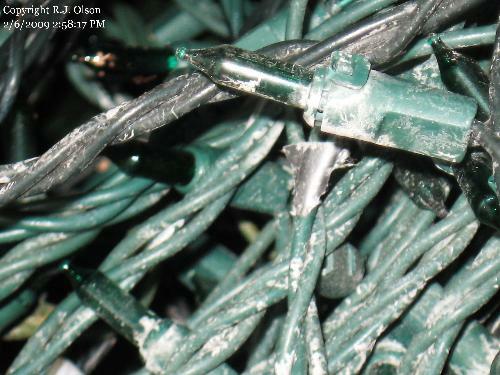 You know, since they're outdoor lights, they're made to withstand rain and snow, so I don't see why you can't take them, one strand at a time, and swish them around in some mild soapy water and then in clean water to clean them. Then, hang them out over the clothes line or something until they're completely dry before putting them away (of course, testing them once before boxing them up). Whattaya think? Vinegar will remove the salt residue.